Snapped with the cellphone camera last week. Need to do some art, finish some long overdue projects AND catch up on your sites!!! 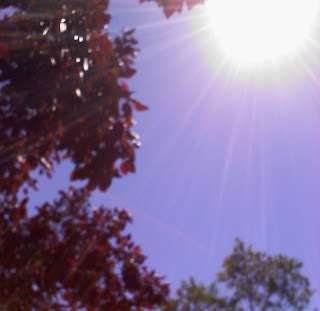 Visit the beautiful skies at http://www.skyley.blogspot.com/ and have a wonderful Friday everyone! oooh, the morning glory has been replaced by a rose. Very pretty! I love Dudley's face! Looks like he's saying "nanner-nanner!" And I love the periwinkle sky! Looks like you had the same searing Friday sun that we had. Too hot!